Chris Tenove is a semi-regular Justice in Conflict blogger, and a Postdoctoral Research Fellow at the University of Toronto. He reported on the Duch trial at the ECCC for Macleans’ magazine and Radio Netherlands. In 2009, Duch became the first person tried at the Extraordinary Chambers in the Courts of Cambodia (ECCC). Every day of the trial, Thierry Cruvellier came to the courtroom on the outskirts of Phnom Penh and carefully watched Duch, along with the lawyers and judges arrayed around him, and the witnesses who took the stand. Cruvellier has established himself as the preeminent journalist of international criminal justice. He has reported on trials in Arusha, The Hague, Sarajevo and Freetown; edited the International Justice Tribune; and authored the excellent Court of Remorse: Inside the International Criminal Tribunal for Rwanda. He believed that the Duch trial would offer something new, the chance to examine at length the mind and motives of a senior perpetrator of atrocity crimes. The result is The Master of Confessions: The Making of a Khmer Rouge Torturer (originally released in 2011 as Le maître des aveux). Among its many virtues, Cruvellier’s book is a master-class in how to evoke characters through description, and none are drawn more sharply that Duch himself. The book also shows what gets missed when researchers (like myself) study international criminal justice without attending trials in their entirety. We forget about the many storylines a trial can offer. These include the competing visions of the crimes – and of justice itself – advanced by lawyers, judges and defendants. They also include the dramatic arcs of individual testimonies, as witnesses respond to questions and to their roiling memories and emotions. I recently spoke with Cruvellier about his book, about the ECCC, and about lessons from the Duch trial that might apply to future international criminal trials. Chris Tenove: Why did you believe that the Duch trial would be exceptional? Thierry Cruvellier: I came to Cambodia after covering international tribunals for 10 years, when I was starting to feel like I should move to a new topic. But I realized the Duch trial would be a unique circumstance. Because of the legal system that applied [the ECCC follows France’s civil law system], there would be no plea-bargaining. So even though Duch was essentially pleading guilty, he would have a full trial. I realized it would be an opportunity to finally hear in detail the voice of the perpetrator. Anyone who covers war crimes tribunals becomes interested in this voice. Only the perpetrator can tell us how that very specific crime – a political crime – actually works. How is it that individuals like Duch, who had not been criminals before this period and would probably never be a criminal after, get involved in a violent machine like S-21? Did you ever worry that Duch wasn’t worth an entire book? That maybe he wouldn’t reveal enough, or wouldn’t be interesting enough, to warrant such attention? Duch proved to be a really unusual man. He was intelligent, talkative, and endowed with an exceptional memory. He could be stiff, he could be arrogant, he could be obsequious or irritating. He could also be charming, in a way, and he had a sense of humor. He also had an incredible capacity to protect himself from dangerous emotions, so during the trial he would break down but never break apart. And he could be sometimes subtle in his thoughts. He was capable of reflecting on himself and on the ideology he had served. So yes, he was a rich character. In most trials, the defendant rejects the criminal acts that allegedly took place, or tries to justify those acts according to political ideology or circumstances. But Duch admitted to the acts, claimed responsibility and criticized the Khmer Rouge ideology. So what was the trial about? The trial was so interesting because, through his detailed responses to every bit of evidence, we could get – not a full understanding – but a closer understanding of how “we” might become Duch. And also, once we have become Duch, how we might live with it. The trial identified some of the steps an individual might go through to become a mass murderer – and that includes the fact that he experienced the social injustice and oppression of the Sihanouk regime, and was imprisoned by it. That’s part of his story. In no way does it make us forgive what he’s done, but it helps show how he got involved in mass murder. The expert psychologists were also very important. They brought a sort of reasonable and scientific understanding about how human beings function in extreme circumstances. It’s impossible for most people to understand how Duch could kill hundreds of children at S-21 during the very time that two of his own children born. But the psychologists could understand and explain this, and tell us about the kinds of mechanisms that we can develop. The defense counsel was critical in this regard. You quote François Roux, Duch’s international defense counsel, asking the courtroom audience: “Will we be up to the task of not only giving back to the victims their humanity, but of readmitting to the human race someone who has abandoned it? That is the great challenge facing our court.” Roux frequently brought attention to the expressions of remorse and admissions of responsibility from Duch. But the OTP didn’t seem to want to accept that version. The Duch trial is the only trial I’ve observed in which what is essentially a guilty plea turned into a very adversarial battle in court, where the parties just never agreed on anything. This seemed unusual to me, because the accused had admitted to 85% of the charges. The prosecution may have had strong and valid reasons to believe that Duch was not as sincere and cooperative as the defense said. They seemed to want an absolutely full and complete recognition of guilt. But we’ve never seen that at other courts, and it’s not how human beings function. Duch couldn’t admit certain things, because he has to live with his crimes and some could be too much to bear. I found that your portrayal of the prosecution was less evocative than it was for other participants. That’s because the prosecution didn’t really have a face. Chief Prosecutor Robert Petit decided not to lead the case. About five of his senior or less senior trial attorneys took turns representing the prosecution. That’s also something I’ve never seen. Usually there is a senior trial attorney who leads throughout a trial. At the Duch trial, they just replaced each other. We didn’t know who was really the voice of the accusation, and I think that was detrimental to the trial. Let’s turn to the victims. Their contribution was more significant than in other trials, because they could act as “civil parties.” How do you evaluate their role? Almost every observer of the Rwandan tribunal or Yugoslav tribunal noticed that the voices of victims were missing. Of course they came as witnesses, but they didn’t tell their own stories. In the Duch trial, we had the very voices that were missing in other courts. They brought an important level of understanding about the nature of these crimes. I call it “the destruction after the destruction.” It is the fact that these crimes destroy lives long after the crimes were committed. I can understand the arguments against this approach. There is no doubt that it makes it tougher for the accused. That’s an extra voice in the courtroom, mainly against him or her. There are other problems, especially in mass crimes when there is such a large number of victims. It’s complicated. So it wasn’t perfect, but no criminal system is perfect. Each brings its pluses and minuses. I found myself wondering whether there are lessons from the Duch trial that could apply to the ICC trial of Dominic Ongwen. There were originally some reports that suggest he may wish to plead guilty to crimes. (For discussions, see Alex Whiting, Sergey Vasiliev, William Shabas and Tjitske Lingsma). And there are questions about his history as someone kidnapped and made to become a child soldier, before he rose in seniority in the LRA. Are there lessons from the Duch trial about how to make a trial contribute to a deeper understanding of how these crimes come about? I believe so, but it depends on the thinking of the main actors involved in a trial. What do they think these tribunals are for? For sure, the heart of it is to deal with the facts of the case and decide if guilt has been proven beyond reasonable doubt or not. In fact, I think it would be good if we stop expecting criminal courts to provide much more than that, because most of the time they are pretty bad at dealing with the rest. The Duch trial was really at another level, because the procedure allowed all these voices to be heard. Which is why the Duch trial was sometimes more like truth commission than a criminal trial. But it made it damn interesting! There’s no simple answer. Every court brings things that are positive, and others that should not be repeated. Obviously, the structure of the ECCC, with this responsibility shared at every level between international and national officials, is totally unworkable. It is a recipe for the process to move slowly, and for all sorts of political manipulation. I think the participation of victims was positive, and it’s worth looking at, even though there were real problems. One of main reasons we switched to hybrid models was to bring trials closer to the society where the crimes were committed. The Khmer Rouge Tribunal has quite a lot to show there. The public gallery has 500 seats, and the tribunal and local NGOs made sure it was full most of the time. For the Duch trial alone there were 30,000 Cambodians who came. The tribunal helped open up public debate on the Khmer Rouge period, which hadn’t really taken place for 30 years. The existence of the court gave local NGOs the leverage and opportunity to push that debate. For instance, in 2009, for first time a short history of the Khmer Rouge was included in the curriculum of schools. Hybrid courts have their problems. The Khmer Rouge tribunal is a terrible example of political interference and corruption, but it has also brought a number of things that are interesting. It might lead some people in the field to believe that the hybrid model – which is not in good shape at the moment – maybe should not be thrown in the dustbin. 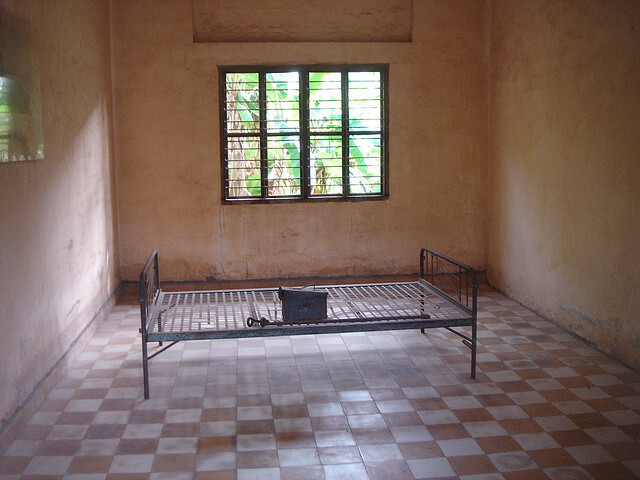 For more on the ECCC, see the recent The Very Trick Trial of the Khmer Rouge in the New York Review Books. For greater depth, see the OSJI’s IJ Monitor, the Cambodia Tribunal Monitor, or Stanford’s Khmer Rouge Trial Monitor. This entry was posted in Cambodia, Extraordinary Chambers in the Courts of Cambodia (ECCC), Hybrid Tribunals, International Criminal Justice. Bookmark the permalink.